Original 5.5 x 3.5 inch color postcard: E. C. Kropp Company, Milwaukee, Wisconsin: Private Collection of Thomas Cook. Digital reproduction of original 5.5 x 3.5 inch color postcard: E. C. Kropp Company, Milwaukee, Wisconsin. Copyright to this resource is held by E. C. Kropp Company and is provided here by RICHES of Central Florida for educational purposes only. Thousands of winter visitors enjoy the daily band concerts at Lake Eola, a favorite beauty spot. A popular promenade is the one mile walk encircling the lake. MADE IN U.S.A. BY E. C. KROPP CO., MILWAUKEE. 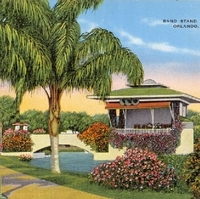 WIS.
“Band Stand on Lake Eola Postcard.” RICHES of Central Florida accessed April 25, 2019, https://richesmi.cah.ucf.edu/omeka/items/show/972.